Outdoor adventures are fun and exciting, but they also come with risks. When something goes wrong, you have to be prepared to make sure that you survive your adventure. 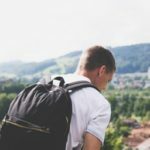 One thing that you should do is to pack all the essential things that you will need and include a Vigilant Trails survival kit to help you in a worst-case scenario. 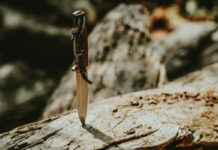 Having such an item in your gear can help you survive in the wilderness, navigate back to civilization or even be rescued. A small, compact survival kit is best. It provides what you need without taking up too much space, making room for other things that you want to pack. 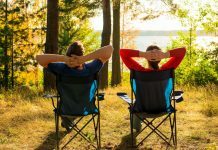 People who go for hiking, fishing, camping and other outdoor activities sometimes prefer to prepare their own kits. Another way is to simply purchase a pre-assembled one such as the Vigilant Trails Model: Trekker-513. 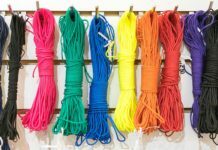 You can even use these pre-assembled items as a basis and add or replace some of the items to create a more practical kit for your needs. This item is dubbed as a “trekker” kit but it can also be used in other outdoor activities and non-hostile environments. 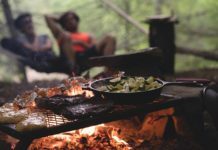 It is one of the highly-rated survival kits on the market today and I wanted to find out if it is really that good. I have reviewed this item and below you will find the complete features as well as what I feel is good and what’s not so good about it. 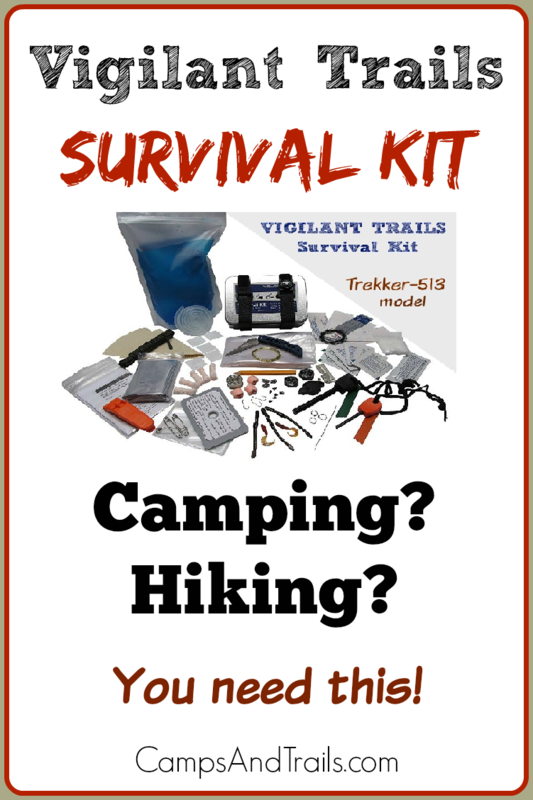 The Vigilant Trails Model Trekker-513 comprises 87 individually-field-tested items to make sure they will really help in a critical situation. 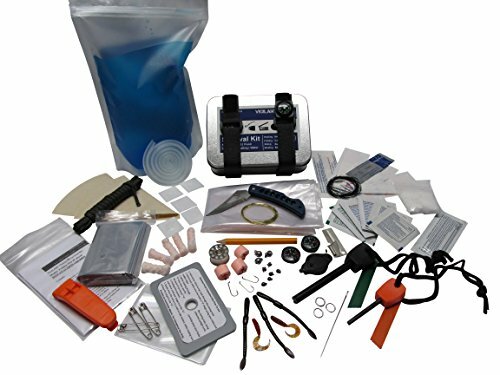 This kit was created with the 6 essentials for surviving in mind: food, water, shelter, fire, signaling and first-aid. All the items included in the box fit snugly inside the crush-proof metal container, which has dimensions of 5” x 3.5” x 1.5”. 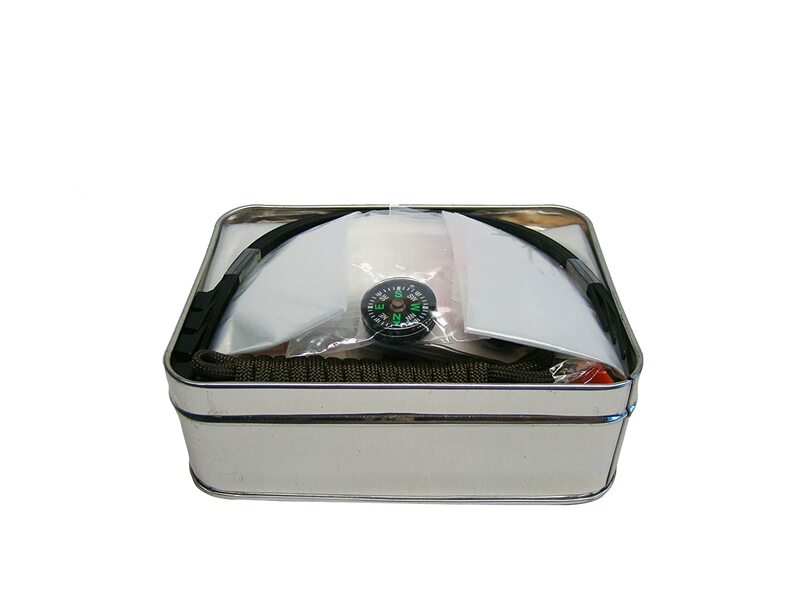 This compact and lightweight box fits easily into your backpack or hunting bag. To make sure that the box doesn’t open up while in transit, there are two compression straps that secure the lid. A compass can also be attached to one of the compression straps for easy access. To help you start a fire, there is a Fresnel magnifier. There are also two flint fire starters with their own steel scraper that you can use. For hydration, the pack provides a stand-up water bag, 2’ airline tubing, purification tablets and coffee filters. When you are in need of a rescue, the signaling mirror, emergency blast whistle and the LKP tinder shots will come in handy. There is also an 84” x 52” emergency blanket to help protect you from hypothermia. It can double as a basic shelter. To help you obtain food, it has an essential fishing set. It includes barrel swivels, treble hooks, 30 feet of #10 fishing line, split shot sinkers, single shank hooks, curly-tail grubs, metal leaders, artificial worms, BB split-shot sinkers and foam floats. With all these, the only thing you will need is a rod. Alternatively, you can just go for line fishing if you can’t find a suitable rod in the wilderness. 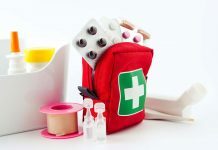 The gear has several items that are used for first aid. You’ll find antiseptic pads, strip bandages, cotton balls, insect sting relief wipes, alcohol pads, butterfly bandages, stainless steel surgical blade, patch bandage, stainless steel needle and vitamin A and D ointment. 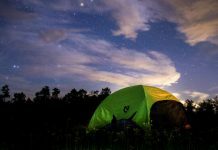 To help you find your way back, it includes 2 liquid-filled and easy-access compasses (one of each), and a water-resistant mini LED flashlight. 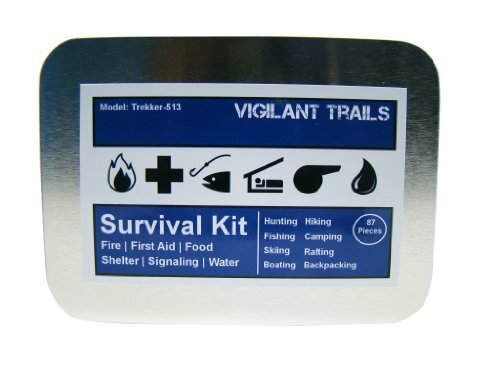 This pack is just one of the assembled kits that Vigilant Trails offers. It is a great companion to their Venturer-215. As we’ve seen, the items included in the set are all field tested, and the pack is assembled in the USA. Each item has more than one purpose and can be used in a variety of ways to help while being outdoors. Being well prepared highly increases your chances of success. This item is a great starter survival kit because it contains 87 items that are practical to use. 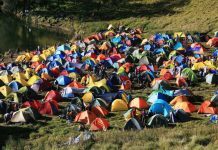 Although it can support your outdoor trips, it is still important for you to know how to use the items in it. 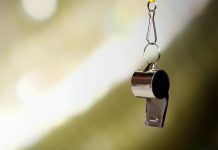 With proper knowledge, someone who has it can use it efficiently to his advantage. 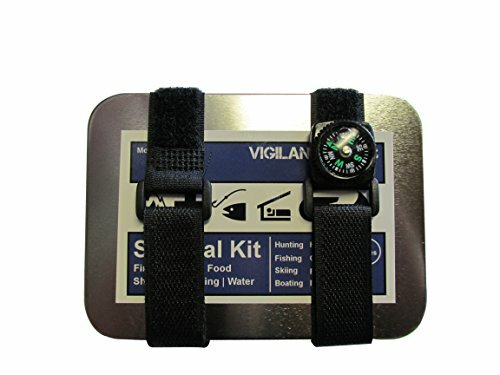 What I most like about this Vigilant Trails Trekker-513 Survival Kit is that so many useful items can be fitted into such a small container. The contents are also not just small, randomly-chosen items. They are well thought out and tested to ensure that they can really provide help during hard times. I would say that there are still things that I would like to see different. I would prefer a better knife. I would also replace the space occupied by the second compass with a more useful item. 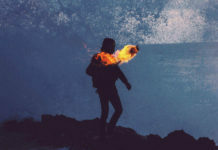 Nonetheless, I would still recommend the kit for outdoor enthusiasts or survival preppers, whether they are new or experienced in critical, life-threatening situations. The kit might be a bit expensive for some.